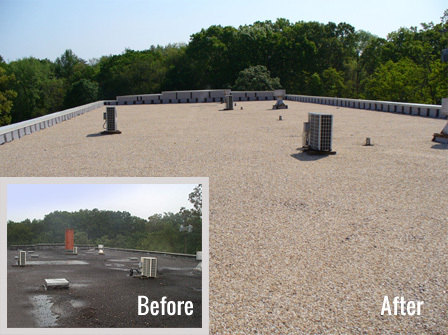 Commercial Re roofing | Old Dominion Roofing & Construction, Inc.
You want your roofing system to be in the best possible condition and meet all safety standards. We will inspect your roof for leaks, tears, structural damage, blistering and safety issues. We will then recommend roofing solutions that brings minimal impact to your day to day operations. Sometimes the roof systems life cycle is complete and a re roof is necessary. Our expert roofing professionals will replace your roofing systems with the best materials and lowest impact to your daily operations. We like to keep our footprint small and our clients satisfaction high. Our company sets the bar high for excellent customer service and professional commercial roofing installations. Not all roofing needs replacing. Sometimes re-covering a existing roofing systems is the better option. If the roof was originally installed properly, has not aged beyond its life expectancy and has minimal damage that can be repaired re roofing can be a more cost effective option. The best way to know whether re roofing your building is an option is to have a expert roofing inspection on your current roofing system. Old Dominion Roofing will provide a detailed inspection report to determine the best option for your roofing. Old Dominion Roofing & Construction, Inc. providing professional re roofing solutions since 1984. We are a full service commercial roofing contractor. Specializing in Flat Roofs for the Industrial and Commercial Industry and committed to providing the highest of standards and services to our customers.